The first stop in Germany was Stuttgart which is about 2 hours and 30 minutes of driving from Zurich and it was an unfortunate time to arrive in the city as I was caught in some heavy peak hour traffic. I did manage to spot the hotel easily while driving and discovered the location was pretty close to the Hauptbahnhof in Stuttgart. A bellboy helped us with the luggage and another one even offered to drive the car over to the side so I could complete my check-in and collect the car later. There was a nice grand lobby on entrance and it felt comfortable from the start. On the right side of the lobby lies the bar and restaurant where breakfast is normally served at. And the left side lies the conference and event rooms, along with a walkway to the spa and wellness centre which I did not check out in this short one night stay. 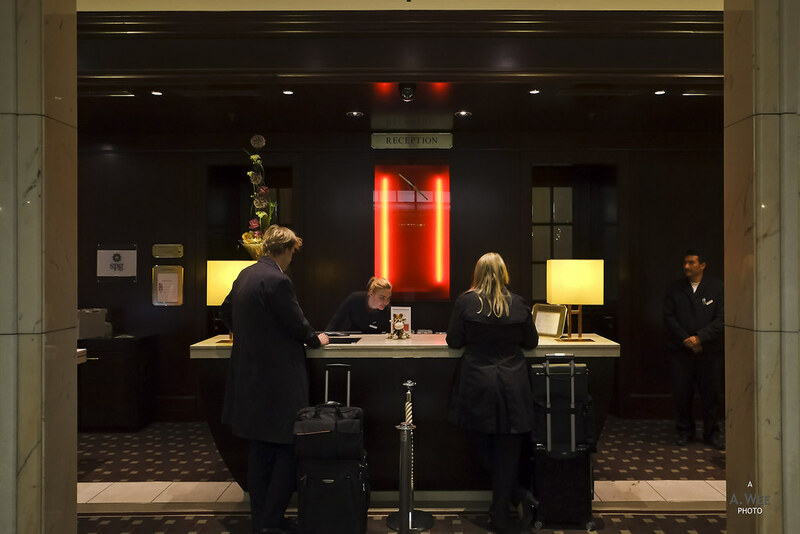 What stood out from the start was the professional and friendly check-in agents that were very charming. Everything was near perfect during check-in from the status recognition to asking me about my preferred amenity. After being given our room keys, I checked out the room and on the way out for dinner, one of the front desk agents provided excellent recommendations for dinner and where to avoid walking in due to the construction occurring in the area. 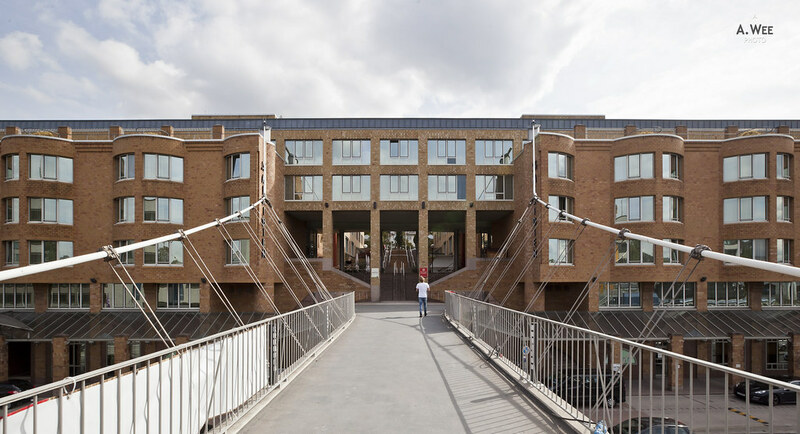 In the morning as we were walking out of the hotel, the agents also advised the route to take as there were some cases of mugging recently from the underground passageway to the park opposite the hotel due to the railway station construction. 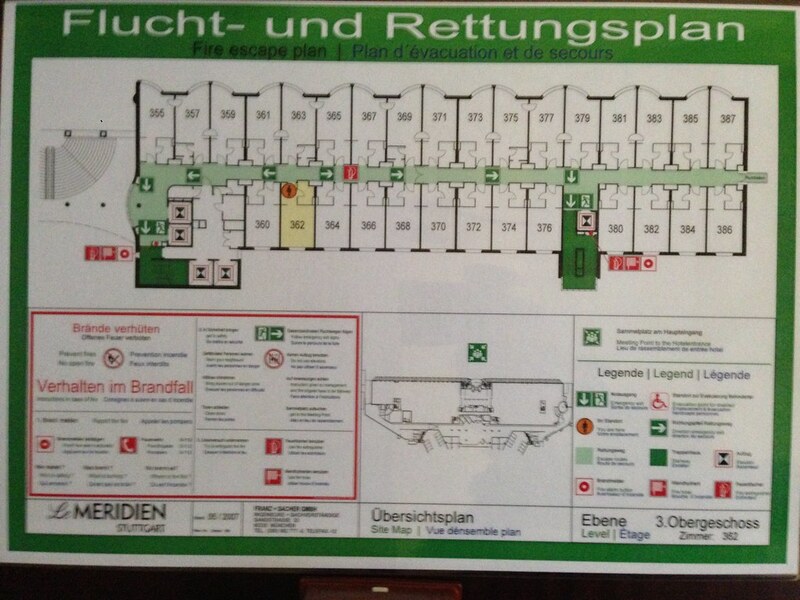 One thing to note for guests is which side of the hotel your room is located at. Lower floor rooms are separated while there is a walkway for higher floor rooms. I went up the wrong elevator as I forgot the instructions provided by the front desk agent, but I eventually found my room which was pleasantly furnished. 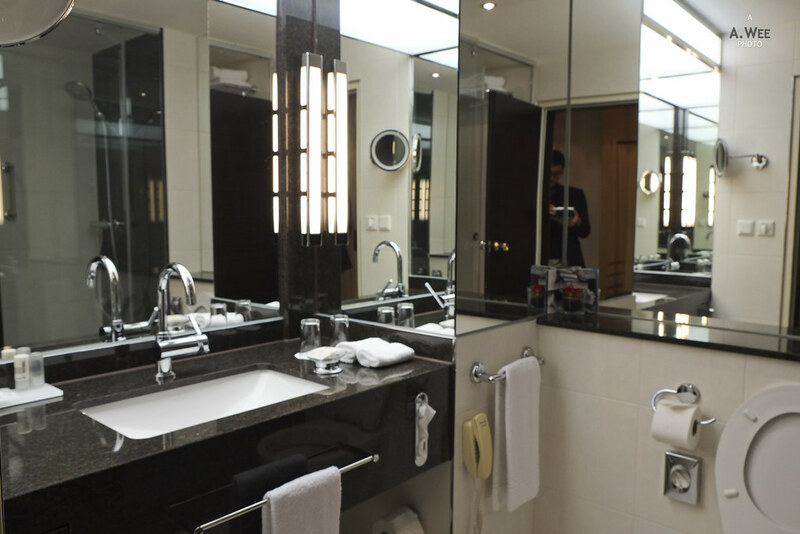 By the left side of the entrance, there was a bathroom with a walk-in glass enclosed shower. While the size of the bathroom is normal and not very spacious, the addition of glass mirrors and nice furnishings make it comfortable. And it is functional with a shower stall, so that is enough to please me. 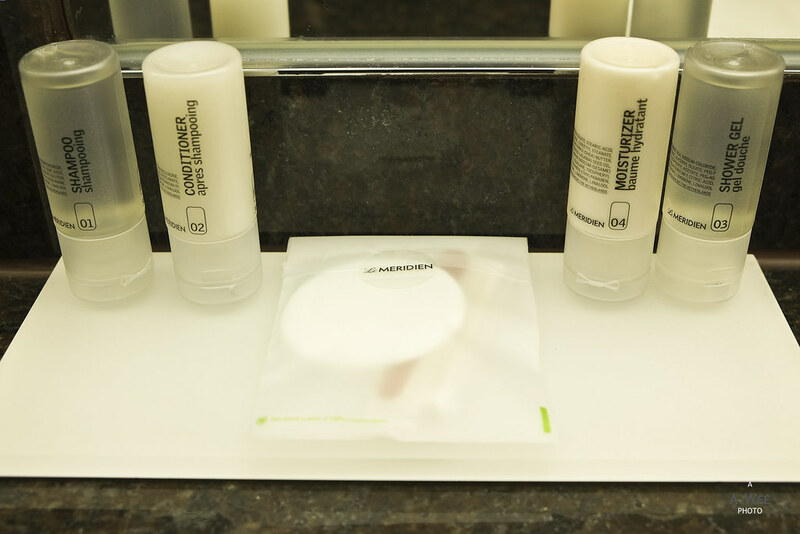 Amenities in the bathroom are standard Le Meridien branded which is decent enough. Inside the room, there was 2 single beds and a wall mounted flat screen TV. The only work desk in the room is placed against the window, and there is a comfortable lounge chair with an ottoman on the corner. 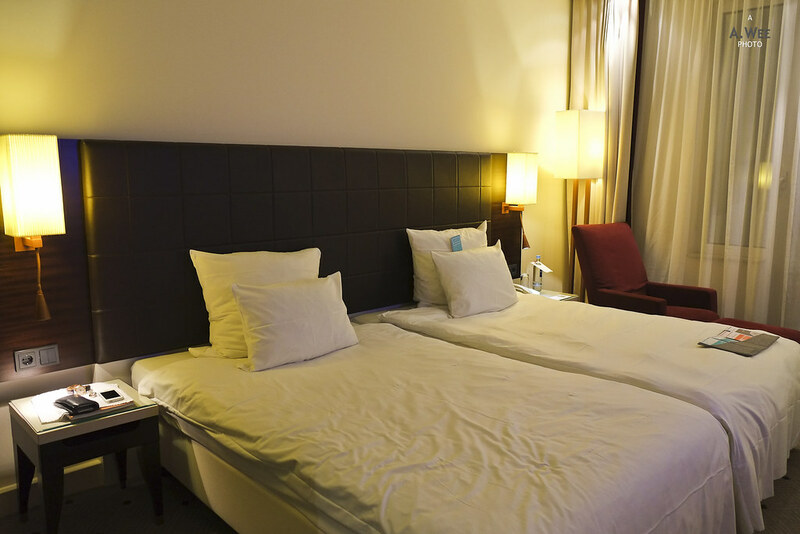 Overall the bedroom was very comfortable, with excellent amenities. Slippers were provided like in most European hotels, though I liked the Sheraton slippers in Europe better as the one in this Le Meridien felt very thin. There was also only one bottle of water provided in the room even when I booked the room for 2 persons. 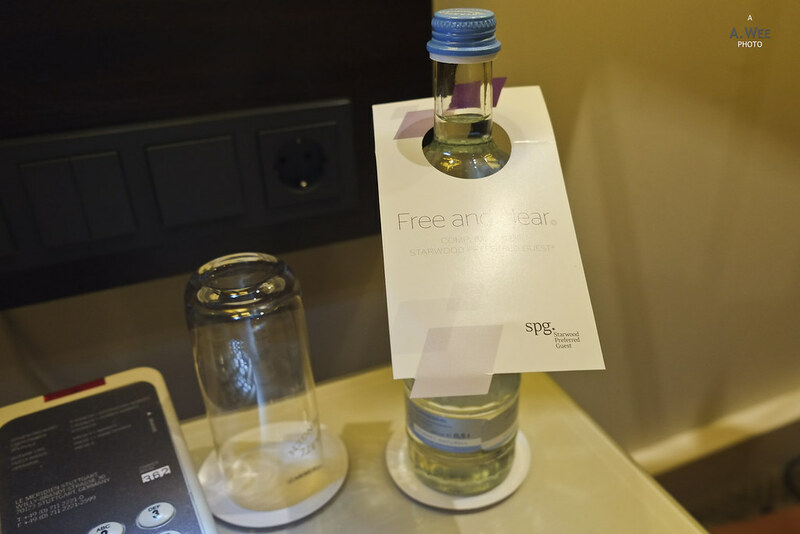 The SPG hotels in Germany really does not want to provide water to guests as per SPG’s policies as I would later realize. 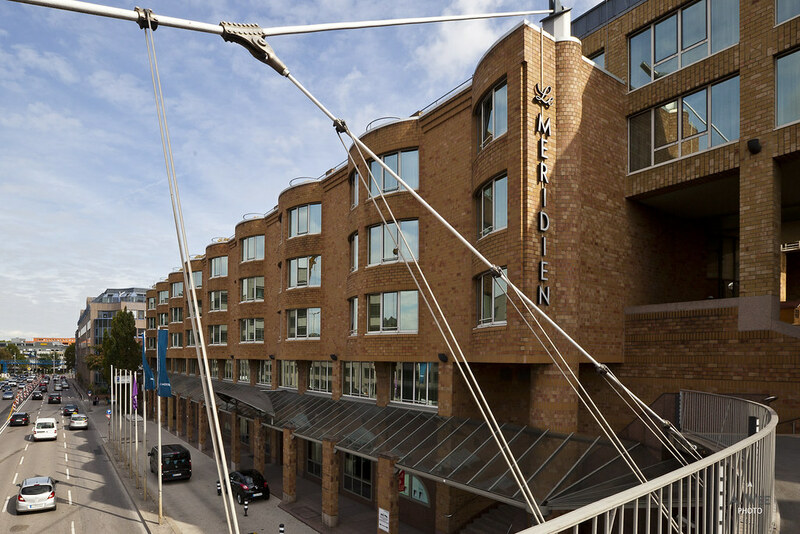 However the hotel did provide a voucher placed along with the usual Le Meridien folder for 2 cups of coffee or tea to be served in the bar. In addition, there was a card that would provide free access to the neighbouring art museum and gallery just a few minutes walk from the hotel. 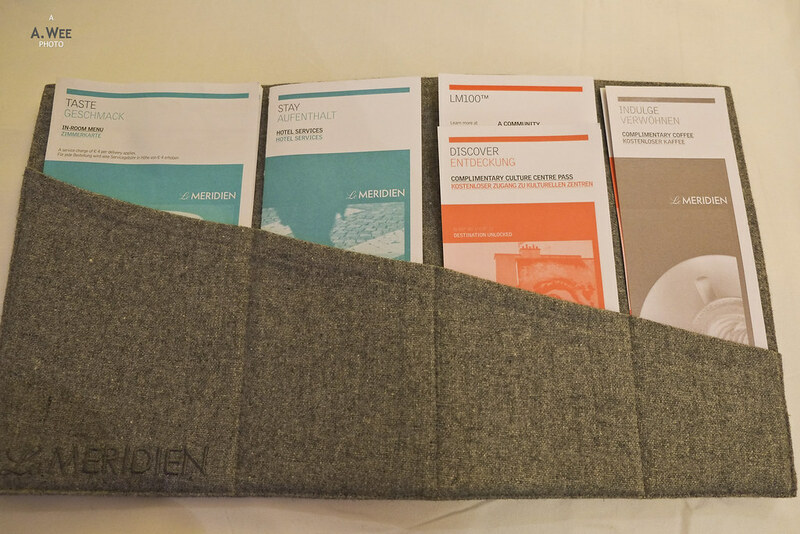 The latter is a part of Le Meridien’s art program and that used to define the brand with its collectible key cards. The rate I paid for the hotel was EUR217 per night (~$200) and there was an additional cost for the one night parking in the hotel. Since the hotel was close to the city centre, we walked towards Schlossplatz which was an easy 15 minute walk in the morning. Opposite the hotel lies the Schlossgarten which is accessible by a footbridge on the second floor of the hotel, where there are also some restaurants. 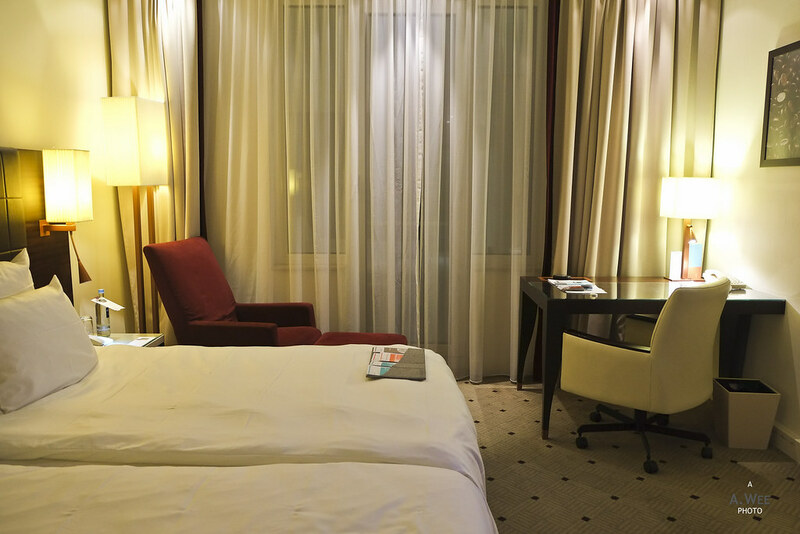 My experience in interacting with the staff was pleasant and the location of the hotel in a modern building yet close to the city centre makes it a great hotel to stay while in Stuttgart.